The Buffalo Bayou Partnership is a non-profit organization that oversees Buffalo Bayou improvements. The Partnership coordinates the integration of major amenities into the Bayou greenbelt and seeks ways to increase community involvement through pedestrian, boating and biking amenities, permanent and temporary art installations, and other natural and built attractions. Visit Houston's newly discovered Mexican Free-tailed Bat Colony! Guests on these tours will enjoy an amazing view of the bats' dusk emergence from our boats on the bayou's waters. Over 250,000 bats call Waugh Bridge home. We will spend the evening viewing and learning more about these magnificent flying mammals that share the city with us. These 30-minute bayou cruises are a great way to spend the afternoon with your family. Escape from the city and enjoy the cool breeze as you glide along the bayou's waters. Look for graceful herons, jumping fish, and even the occasional alligator sunning on the bayou's banks. 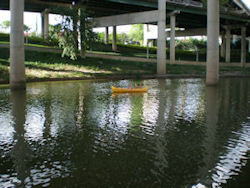 10:00 a.m. to 2:00 p.m. unless otherwise noted, including twilight tours, on www.buffalobayou.org website. 10:00 a.m. to 12:00 noon and 1:00 p.m. to 3:00 p.m.
Paddlers will venture into the lushness of the bayou, exploring the urban oasis of Houston. Join us for one of our unique afternoon-guided paddling trips. The outfitter will be providing easy to use, tandem (2-seater) sit-on-top recreational kayaks, “mini kayak lessons,” and paddling and safety gear on these excursions.